One Chain Vineyards, like Thistledown, is overseen by Peter Leske, Giles Cooke MW and Fergal Tynan MW. Comprising two distinct ranges (Cricket Series and Character Series) One Chain works with growers to source fruit from some of the most established regions of South Australia. The Character Series portfolio has a range of beautifully produced and packaged wines, benefiting from the same ultra premium quality fruit sourced for Thistledown. These are wines that are immediately pleasing, yet authentic expression of the variety and place. The fruit is sourced from Justin Ardill’s easterly facing vineyard situated in the famed Watervale sub-region of the Clare Valley. The vines are grown on their own roots in a soil consisting of red clay over limestone. Yields at just 2 tons per acre are very low which ensures high quality, concentrated fruit. The wine is fermented at a cool temperature in stainless steel to retain fruit profile and the finished wine is aged on its lees for 2-3 months before bottling. 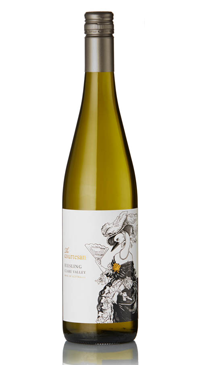 Capturing all the mouthwatering lime and elderflower character one expects from great Riesling, the Courtesan has a voluptuous palate hinting at grapefruit, ripe melon and quince.